Are Buyers Irrational When They Don't Select Me? The other day Seth Godin posted one of his usual life lessons. The moral of the story is that buyers are irrational so no matter what you're selling be prepared to adapt to the customer's wishes... or find other customers. 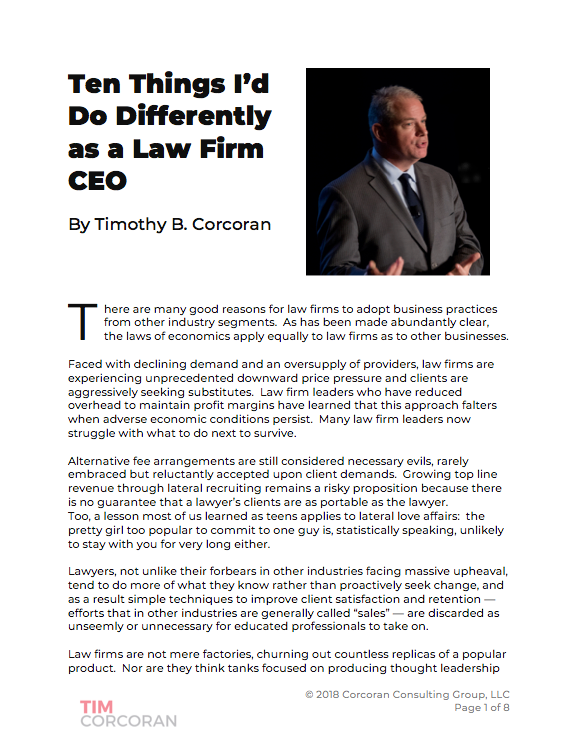 Patrick Lamb followed up with the legal angle, cautioning law firms not to assume their "buyers," namely corporate law departments and executives, are irrational. In his words, "I AM NOT suggesting that clients are irrational customers. Far from it." He then follows up to declare that when the buyers have "(1) the money you want and (2) the power to decide whether to hire you or not, any discussion of rationality is wasted breath." Patrick makes an excellent point. Semantics don't matter so much when the real point is to demonstrate value, to prove that you'll make their life easier. But it might be helpful to define terms. After all, logic and rationality play a fundamental part in how lawyers -- both buyers and sellers -- think and act. Lawyers often market their services as an exercise in logic: You have a business which has a need for legal services. You need to hire a law firm to assist. We have worked with companies like yours. We have smart, well-educated, experienced lawyers on staff to think through big issues so you don't have to. We have many offices and a large staff with cutting edge technology. We have worked on engagements addressing problems substantially similar to the sort of problems you're like to encounter in your business, if your business follows the pattern of our other, similarly situated clients. We have summarized our expertise into biographies and deal lists, and we show glimpses of our smarts by posting articles on our website. We charge a lot but we're worth it, for the aforementioned reasons. Our reputation will insulate you from criticism should forces beyond our control lead to an unwelcome outcome for the engagement. THEREFORE, we kindly await the arrival of your first engagement. Or as one law firm partner explained to me: "We pitched them our credentials and we're waiting for the deal flow." Surely a rational buyer can't object to the sound logic. And even if the buyer's reasoned analysis inadvertently allows a few competitor firms to slip into the conversation, we'll still get the work because we're demonstrably better. When it's put this way, no wonder many law firms are too busy to actually learn about the client's business, because it's not the law firm's problem. At the law firm, it's our job to show how good we are. It's the clients job to figure out where we can help. But buyers are irrational. They don't make decisions based solely on sound logic. Or at least not the logic we've outlined here. But that doesn't mean they act foolishly and without forethought, their decision process is rational in their minds. Company executives and by extension their legal departments have business challenges. They need to defeat the challenges, work around the challenges or even learn how to live with the challenges. When seeking help, they turn to people who understand the challenges and the context. They seek people they trust, whose contributions are additive, in keeping with the business philosophy and risk profile, whose contributions are delivered in the manner that is most effective to the business. They seek help from people whose reputation for excellence is beyond reproach from a variety of perspectives -- including perspectives of many who have no legal domain epertise. They seek help from people they like to work with, who fit into the culture. And let's not kid ourselves, buyers seek help from people who have contributed in the past because sometimes they're too busy to research alternatives. They seek cheap when they otherwise can't explain why higher cost is better. They seek well-known names when there's no time to seek lesser-known names and low tolerance for a learning curve. Is this irrational? Not at all. It's a rational process to decide who's the best fit. But best fit is defined by the buyer, not the seller. Rationality is in the eye of the beholder. Law firm partners, stop what you're doing and go find the last RFP response you submitted, or the latest pitch book, or the latest proposal letter you drafted. View it from the eye of the buyer. Have you incorporated any of his or her concerns, fears, desires or wishes? Or have you done a lot of describing yourself and your firm? If a "best practice" proposal is 80% about the client's needs and 20% about you, then how close are you? What can you do to address this in time for the next proposal or pitch session? A version of this post originally appeared on Tim's personal blog.